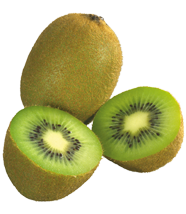 Kiwi, also called Chinese Gooseberry, edible fruit of the vine Actinidia chinensis (family Actinidiaceae). The plant is native to China and Taiwan and is now grown commercially in New Zealand and California. The egg-shaped kiwi fruit has a furry brownish green skin and firm, translucent green flesh with edible purple-black seeds at the centre. The fruit has a slightly acid taste resembling that of a gooseberry or perhaps a honeydew melon. It can be eaten raw or cooked, and its juice is sometimes used as a meat tenderizer.